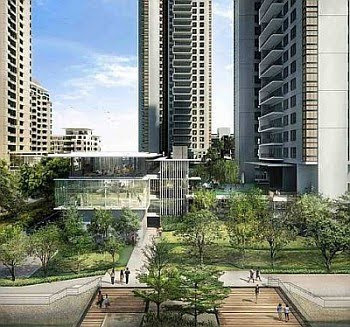 An artist impression of Five Stones, a condominium project in SS2, Petaling Jaya. Last Saturday’s launch of double-storey linked houses in Glenmarie, Shah Alam had buyers queuing up several days before selling began. The 133 freehold units, located from across a Perodua service centre, were sold in two hours. At RM750,000 for an intermediate unit, the offerings from Island & Peninsular Bhd (I&P), known as Temasya Suria, were by no means cheap. Even as you are reading this today, I&P is selling another series of double-storey housing in Bandar Kinrara, Puchong. Known as Sentosa, the 80 units of double-storey terraced houses are priced between RM462,000 and RM694,000. As with previous week’s launch, buyers were known to have been queuing up several days. General manager (group marketing and communications) Noor Lida Nazri says both situations reflect the confidence in the market. “Although many invest in different types of assets, there are those who find property to be the most reliable. They are essentially going back to what our forefathers have always believed in,” she says. More than half of the buyers bought to stay, she says. It has been quite some time since freehold double-storey terraced housing, a staple in Malaysian housing market, has been put on the market and the interest generated is interesting. Noor Lida says the other reason for the positive response is the financial package they are offering. Buyers pay 10% and their next payment is due when they get their keys. In the interim, the banks will pay the progressive payments and interest. Stamp duty, transfer and legal fees are absorbed by the developer. The fact that Temasya Suria is about 75% complete when they reached the market is also a selling point, Buyers will be able to move in the first half of next year. Its second project in Puchong will take two years to complete. On Aug 14, Selangor Dredging Bhd (SDB) will be launching what will be Petaling Jaya’s most pricey condominium project in SS2/72. It will be SDB’s branding vehicle. The last time they had an outing there, it was with Ameera in 2007, which had prices starting from RM380,000 onwards. Although it is building Ameera which will be ready next year, that project is a legacy from Luxor group, the previous land owner. With this second project, known as Five Stones, SDB managing director Teh Lip Kim has a clean slate to put down her mark. It will be different from Ameera in terms of ambience and landscaping with lots of open space. The 185-unit freehold project comprises three low, medium and high-rise blocks with prices starting from RM800,000 onwards, a jump of about RM500,000 from its Ameera launch. Size ranges between 1,700 sq ft and 2,400 sq ft while Ameera comes in smaller packages. Over the last three months and in the months ahead, developers had, and will continue, to dangle a carrot in terms of financing to get sales moving again from Penang to the Klang Valley. This has been a strong factor in pushing up sales. Most of these developers are among the country’s top players in the sector (see table). But will sales continue to be buoyant when this carrot is taken away? Two sources, an analyst who has been tracking the property market, and another from a locally incorporated foreign bank, say “for sure, it is still a buyer’s market”. Says the bank source: “The attractive financing packages worked out by developers and their banking partners today reduce the price by between 5% and 7% for the buyer. This will eat into their margins. They may have the sales, but profit will slack. “This trend of dangling the carrot has triggered a lot of forward buying. Many of the buyers may not need a house but because they have the savings, and all these costs are being absorbed by the developer, they enter the market. Every developer is selling at a discount because they have to sell. Because the buyer are billed on a progressive basis, the sales are recognised only a few years later, until the house is built. There is a delayed revenue recognition. Hence, although the pickup rate is positive, profit will be slack because of the carrot they have been dangling since the beginning of this year. Only when the carrot is taken away and the sale is as good as before, then one can safely say the market is rosy again, he says. In the 1997/98 Asian financial crisis, the property market only picked up late 2000 and early 2001 and peaked at 2006. The pickup took time. Between a V and a U-shaped recovery, he would prefer a U, says the bank source. An analyst who has been tracking the sector says the optimism throws into focus how bad the situation was in the last quarter of 2008. As the year comes to an end, he says, developers will end their financing schemes because they eat into their margins. “We will continue to see sales but this may be less compared to what we saw the last few months. Hopefully, the good run seen in June and July will continue into the coming months in what has been an erratic year,” he says. When Diane See decided to move to Ara Damansara, after her daughter Jona, 5, got a place at the neighbourhood kindergarten last year, she found the home of her dreams nearby. It was attached, with five bedrooms – but, sadly, at RM700,000, it was beyond her price range. See, who was renting in the interim, finally bought the property this year for just RM525,000. She completed renovations three weeks ago and intends to move in once the new patio is ready and the decorators have left. “I was so pleased, because I couldn’t afford to pay more than I did, and I had been looking at it for sometime,” See says. “It’s a fascinating location and it’s all gone smoothly,” she says. A wise person once said “don’t buy the house, buy the neighbourhood”. It certainly pays to know what’s the going rate per square foot in your neighbourhood. It seems to be a cracking time to be buying residential properties especially in strategic locations. The general consensus is that 2009 is shaping up to be a good year for the country’s housing market. According to an analyst with a local research house, it is generally a good time to buy property now especially for owner-occupier residential property. “Interest rates are at an all-time low while developers are willing to absorb much of the upfront property ownership costs such as stamp duty, legal fees, and interest,” he said. He adds that buyers who are waiting for cheaper prices are going to be disappointed as prices have generally been stable (some even higher). “Unlike during the Asian financial crisis a decade ago, there is no fire sale in the secondary market now. Even the developers are in stronger financial footing as the current gearing level is half of the level seen during the Asian financial crisis. This means developers can wait for sentiments to improve before launching new properties rather than dumping them at fire sale prices,” he says. He says although much of the recent revival in residential property transactions was due to the attractive housing loan packages offered by developers and there is a possibility of buying activities easing once these packages are terminated, it does not mean that prices will start falling. “As consumer sentiments improve and fear of job losses dissipates going forward, buying activities will continue even without the housing loan packages,” he says. There are also bargains to be found in forced sale situations for whatever reasons they are placed on the market by mortgage lenders who have repossessed them from landlords who were unable to keep up with their mortgage payments. A banker with a local bank who handles auction sale says that it has been improving from year to year. “This year auction sales probably have the best improvement due to fewer options in the primary market and fair value as compared to new properties,” he says. He says year to date there has been an increase of 20% in terms of value and 11% in terms of transactions under his portfolio. He adds that the increase is due to public acceptance towards auction and an increase in participation of real estate agencies in auction marketing. Meanwhile, Kim Realty business development manager Azlan Adnan who has sold four properties last month says that a notable trend in this low interest climate is that government servants are opting to take bank loans instead. “We’re getting to the stage where civil servants are opting for bank loans and saving their government loans until they get a promotion and are entitled to a higher loan later,” he says. “People are actively looking for properties,” Azlan says adding that current low interest rates make it a good time to buy now. Apparently, it is a message that appears to be getting through to would-be buyers as well. Dean Tan, 35, a lawyer, is hoping this will work for him: He is planning to add another property to his portfolio. According to the Valuation and Property Services Department, the residential property sub-sector continued to spearhead market transactions last year by contributing 63.7% and 46.8% of the transaction volume and value, respectively. In total, 216,702 transactions worth RM41.30bil were recorded in 2008 against 199,482 transactions worth RM36.5bil in 2007. For SK Brothers (M) Sdn Bhd managing director Chan Ai Ching, sentiments seem to be returning. However nothing beats doing your homework to ensure that the price, package and property meet your requirement. “It would not be wise to buy for the sake of buying,” she says. So instead of leaving your money in the bank, earning little interest – put it in bricks and mortar. But unlike stocks and money, which can lose value on any day, you cannot dump real estate in a single day and try something new tomorrow. With the dust of the global financial crisis settling at least for now, barring further surprises, the new liberalised environment for the country’s business and property sectors is a good platform for local property players to leverage on. If the relaxed measures are able to attract more foreign direct investments (FDIs) in the country’s business and property sectors, there should be greater demand for commercial and residential property from these foreign investors. In fact, the removal of the Foreign Investment Committee ruling for foreigners purchasing commercial property has the potential to turn Malaysia into a vibrant commercial property market as more foreign investors are attracted to the market. The commercial market has turned a lot more liquid and there could be more en-bloc transactions down the road. The market has proven its resilience with capital values and rental rates for commercial space holding out quite well despite the onslaught of the global financial crisis. However, to give a further boost to the local business environment and inflow of FDIs, it will certainly help if the Government can further liberalised the tax structure for businesses and individuals to raise the country’s competitiveness. As for the residential market, the existing low interest rates for property financing and the housing packages that are still offered by most of the developers are attracting stronger buying interest. Those who have yet to purchase their own property and are shopping around for one still can take advantage of the low entry cost until developers decide to put a stop to these facilities. Going by the strong take-up for some of the recently unveiled condominium projects around the peripherals of Kuala Lumpur, it looks like more Malaysians are resorting to investing in property to hedge against inflation. After all, bank interest rates for property financing are at one of their lowest and it will be wise to lock in at the current levels. Meanwhile, industry players are also anxious to get on with their project launches once again after having to defer their plans over the past three quarters since the crisis broke out last September. After having laid low for much of the past few quarters, it is not surprising that developers are eager to unleash their products and are lining up a string of projects for launch. A variety of property products will be making a beeline for the market soon. They may feel that delaying the launch further will mean higher holding cost for them. But, a word of caution for developers. The local economy is not yet out of the woods and the gross domestic product for the second quarter is likely to remain in the negative terrain, although the contraction is expected to ease and bottom out by year-end. There is still an imbalance in demand and supply in the property market for now and it will take a few more months before a more balanced market sets in. Developers should be prudent and conduct proper feasibility studies before launching their projects, especially new greenfield projects that take many years to complete. Gauging the market response through project previews and pre-launch registrations will show whether a project is ready for launch. To register sustainable earnings growth path going forward, developers have to come out with holistic plans for their residential and commercial properties. There should not be a sudden clamour for project launches but they should be based on market fundamentals and actual takeup rates. As the market is just about to make a turnaround and it is still very much a buyers’ market, developers have to be prepared with more quality projects and the right product offerings at the right pricing. ·Deputy news editor Angie Ng hopes to see more vibrancy back in the property market soon. PETALING JAYA: AWC Bhd, an integrated facility management and engineering solutions provider, has secured a contract worth RM177.4mil in Abu Dhabi from Aldar Properties PJSC. AWC via its subsidiary Nexaldes Sdn Bhd is to design, supply and install its proprietary Stream automatic pneumatic waste collection system at the eastern precinct of the Al-Raha Beach Development. Aldar Properties is a real estate development, management and investment company. AWC group chief executive and managing director Azmir Merican said the contract would cover the period of 2009 to 2011 and included an infrastructure package for eight waste transport pipe networks of about 20km and four collection stations to serve more than 100 development plots, many of which would be built over the next five years. “The contract also includes some in-plot works like Aldar’s iconic headquarters building, the upscale island development of Al Bandar and the Garden City of Al Zeina,” he said in statement yesterday. The US$18bil Al-Raha Beach Development is a mixed development, consisting of 11 precincts sprawling across an 11km coastline that include residential, commercial, retail, entertainment, hospitality and canal components draped around an impressive marina. It is scheduled for completion by 2019. KUALA LUMPUR: Land & General Bhd (L&G) is embarking on a new chapter of business growth after settling all its debts and will now focus on property, plantation and education as its main business. Managing director Low Gay Teck said with cash reserves of about RM100mil, L&G would unlock some of its assets for property developments that would contribute positively to the company’s performance in the financial year ending March 31. “Our main focus will be the developments in Bandar Sri Damansara that include commercial, high-end condominiums and the recently launched commercial development of 8trium,” he said yesterday after the company EGM. Shareholders had approved the proposed resolutions to reduce the par value of L&G shares from RM1 to 20 sen and reduce L&G’s share premium from RM133mil to RM14.6mil. Low said the credit resulting from the exercise would be sufficient for L&G to fully eliminate its accumulated losses of RM597mil as at March 31. Having settled its redeemable convertible secured loan stocks of RM71.7mil on June 30, L&G’s gearing is now zero. Low said for FY10, property business would contribute more than 50% to L&G’s revenue while the rest would come from plantation and education business. “We plan to launch a high-end condominium project with an estimated gross development value of RM1bil in Bandar Sri Damansara. Our sales launch target is next year. This project will take about five to eight years for completion,” he said. He added that the company also had 36 acres and 12 acres respectively in Sungai Petani, Kedah and Johor Baru that could be used for future development or disposed of for income. L&G was also in the process of disposing part of Sri Damansara Business Park for about RM30mil. On plantation business, Low said L&G was targeting to complete the planting of oil palm on the remaining half of its Ladang Sg Jernih estate near Tanjung Malim within three years. Ladang Sg Jernih is about 2,500 acres, of which 50% is currently planted with oil palm and rubber trees. “In the education sector, we will continue to expand Sekolah Sri Bestari’s (in Bandar Sri Damansara) physical facilities and continue with teachers’ training programmes as the main strategies to increase student enrolment,” Low said, adding that this year, the school’s enrolment was 1,000, a modest increase from last year’s 943 students. Low said L&G was also looking for more land locally (around the Klang Valley) and internationally for future property development opportunities either through joint ventures or strategic alliances with landowners. Currently, the company is involved in a joint venture development called Hidden Valley in Melbourne, Australia, developing 2,500 acres for bungalow lots and a 18-hole golf course. Low said about 70% of the development was already sold. The local construction industry is expected to maintain its 2008 revenue of RM60 billion this year, despite the global economic downturn, says Master Builders Association Malaysia (MBAM). MBAM president Ng Kee Leen said the sector expects to see some improvement in the second half of this year as the government starts awarding contracts under the RM60 billion stimulus package. "The last four quarters have been slow for the sector. But going forward, we are optimistic as more tenders will be called. The big boys are hoping for contracts to build schools, hospitals, roads, highways and the low-cost carrier terminal," Ng said in Bandar Sunway, Selangor, yesterday. "Although we see some light, we hope the government will speed up the process for awarding projects," he said. The first stimulus of RM7 billion had benefited some 15,000 small contractors who were given contracts for building works, maintenance and repair, and the extension of schools. Ng said the construction sector had a record breaking revenue of RM65 billion in 2007. This figure could improve but there is concern now as the government has imposed the ad valorem stamp duty of 0.5 per cent for private and second-tier government construction contracts, which was proposed under Budget 2009. This means ordinary service agreements are slapped with a 0.5 per cent stamp duty of the total contract value, whereas previously the stamp duty was fixed at RM10 for all types of contracts. Ng said MBAM wants the government to review the stamp duty as it has resulted in serious cash flow constraints as contractors have to pay the fee up-front before they could get a hold of a contract. "The money must be ready before they sign the contract. If the stamp duty is not paid, the contractors will not be able to get bridging loans and insurance. And, if they are government projects, the contractors would not be able to submit claims. "There is inconvenience of doing business and also uncertainty. This is the voice from MBAM's 5,000 members, who command 70 per cent of the construction industry. We urge the government to revert to the previous practice of a RM10 flat fee for all types of contracts," Ng said. He added that the stamp duty rate was exorbitant as contractors are also paying the Construction Industry Development Board (CIDB) a levy of 0.125 per cent on a construction contract. The new ruling would cost the construction industry RM300 million more a year, or four times more than the CIDB levy of RM75 million per year. Works Minister Datuk Shaziman Mansor had said in June that the government needs to relook the stamp duty of 0.5 per cent as it is having a negative impact on the construction sector. The Building Industry Presidents' Council had a dialogue with the Ministry of Finance Inc in Putrajaya yesterday to present the impact of the new stamp duty rate, with the hope of reverting back to the old system. The council members comprise MBAM, the Real Estate and Housing Developers' Association Malaysia, the Malaysian Institute of Architects, the Institution of Surveyors Malaysia, the Institution of Engineers Malaysia and the Association of Consulting Engineers Malaysia. Hap Seng Consolidated Bhd has bought half of Inverfin Sdn Bhd, owner of Menara Citibank in Jalan Ampang, Kuala Lumpur, for about RM310 million. Its subsidiary, Hap Seng Realty Sdn Bhd (HSR) bought all interests in Inverfin owned by CapitalLand Ltd and Amsteel Corp Bhd. The remaining half of Inverfin is owned by Menara Citi Holding Co Sdn Bhd. A Citibank Malaysia spokesperson said it is not in talks to sell its 50 per cent stake in Inverfin. Late last year it wanted to sell its interest in Inverfin to IOI Corp Bhd but the deal fell through. The Amsteel stake comprising 2,000,001 shares is presently charged to RHB Investment Bank Bhd. This confirmed a Business Times report on June 30 2009 that Hap Seng was interested to buy half of Menara Citibank. Inverfin is a special purpose entity and investment company formed for the sole purpose of owning and operating Menara Citibank. At the end of August 2007, Inverfin issued medium term notes of RM160 million to selected investors where it charged Menara Citibank as security in respect of the notes. Menara Citibank is built on a parcel of freehold land, measuring 12,694 sq m and has a net lettable area of 68,156 sq m.
Inverfin is the proprietor of Menara Citibank, and shares the use of five levels of basement car parks with the proprietor of an adjacent property known as "Hotel Nikko". The purchase price of Inverfin is based on 50 per cent of the net asset value of the company as at June 30, after taking into account the agreed property value of Menara Citibank which is fixed at RM607,45 million. It is understood that Hap Seng is paying RM850 per sq ft of lettable area. The transacted prices of prime office buildings within the Golden Triangle and the Central Business District were in the range of RM800 to RM1,200 per sq ft of lettable area. The gross rental revenue based on the latest audited accounts of Inverfin for the financial year ended December 31 2008 was approximately RM48.76 million, giving a gross yield of 8.03 per cent. Inverfin's operating profit was RM38.13 million, giving a net yield of 6.28 per cent. The rental revenue and operating profit are expected to improve with the rent rollover for year 2009 onwards, Hap Seng said in a statement to Bursa yesterday. Hap Seng said the purchase is consistent with the group's corporate business direction of expanding its property division both for development and investment holding. 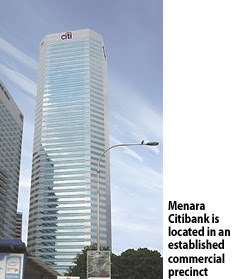 Menara Citibank is located in an established commercial precinct and is expected to rise further in popularity. Hap Seng proposes to borrow from banks up to RM200 million to pay for the purchase, while the balance will be paid by internally generated funds. With the acquisition, Hap Seng's gearing ratio is expected to increase from 1.06 to 1.14 based on its audited accounts as at December 31 2008. PETALING JAYA: Hap Seng Realty (KL City) Sdn Bhd, a wholly-owned subsidiary of Hap Seng Consolidated Bhd, has acquired a 50% stake in Inverfin Sdn Bhd, the owner of Menara Citibank in Jalan Ampang, Kuala Lumpur. According to a company filing with Bursa Malaysia yesterday, the 50% adjusted net asset value of Inverfin as at Dec 31, 2008 was RM235.39mil. The vendors are CapitaLand Ltd that holds 30% in Inverfin and Amsteel Corp Bhd, which has a 20% stake. Menara Citibank, previously known as Menara Lion, is parked under Inverfin. The remaining 50% stake in the company is held by Menara Citi Holding Co Sdn Bhd. CapitaLand’s 30% stake comprises three million ordinary shares while Amsteel holds 2,000,001 ordinary shares in Inverfin. According to Hap Seng Consolidated group managing director Datuk Edward Lee Ming Foo, the purchase was in line with the company’s corporate strategy to expand the its property holding and development division. “Demand for prestigious office space in the heart of the Golden Triangle has not waned despite the global economic downturn. “Based on our experience in the market, we expect demand to remain robust, if not improve, while supply is naturally kept limited in super-prime areas such as these,” he said in a statement yesterday. The 50-storey Menara Citibank has a net lettable area of about 68,000 sq m.
“The unique propositions of Menara Citibank offer potential for rental growth as well as capital appreciation. “This will bode well for the group in terms of sustained recurring income and long-term value for its property division,” Lee added. Menara Citibank will be the second major acquisition by Hap Seng. In 2004, it bought the 22-storey MUI Plaza from the MUI Group. The company spent some RM60mil on the purchase, including refurbishing the building. A CapitaLand statement said the consideration of RM145.1mil for its Inverfin stake would be wholly satisfied in cash and was subject to a post-completion adjustment of the net asset value of Inverfin at the completion date, which is expected to be in November. It further said the completion of the sale was subject to the fulfilment of certain conditions set out in the agreement. Upon completion, Inverfin will cease to be an associated company of CapitaLand. In response to queries from StarBizWeek, a CapitaLand spokesman said the divestment of the company’s stake in Menara Citibank was in line with its proactive portfolio management, which included asset enhancement and strategic investment and divestment decisions. “Malaysia remains one of CapitaLand’s key markets in South-East Asia and the company continues to have a presence in the commercial, retail, residential, serviced residence and real estate financial services sectors in the country. “The real estate market has immense underlying potential. The Government’s pro-business policies have presented many opportunities for international real estate companies like CapitaLand to leverage on its multi-sector and multi-local strategy. “Riding on this positive backdrop, CapitaLand will continue to strengthen its footprint in Malaysia,” he added.